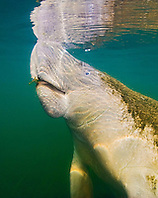 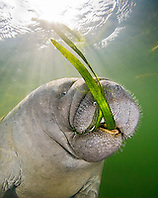 The West Indian Manatee, Trichechus manatus, is a manatee, and the largest surviving member of the aquatic mammal order Sirenia (which also includes the Dugong and the extinct Steller's Sea Cow). 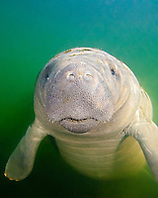 The West Indian Manatee, Trichechus manatus, is a species distinct from the Amazonian Manatee, T. inunguis, and the West African Manatee, T. senegalensis. 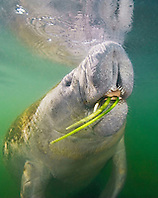 Based on genetic and morphological studies, the West Indian Manatee is divided into two sub-species, the Florida Manatee (T. m. latirostris) and the Antillean Manatee or Caribbean Manatee (T. m. manatus). 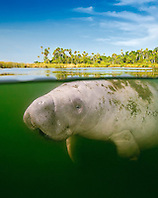 However, recent genetic (mtDNA) research suggests that the West Indian manatee actually falls out into 3 groups, which are more or less geographically distributed as: (1) Florida and the Greater Antilles; (2) Central and Northern South America; and (3) Northeastern South America.